4. Click the Browse button and select the picture you would like to paste. 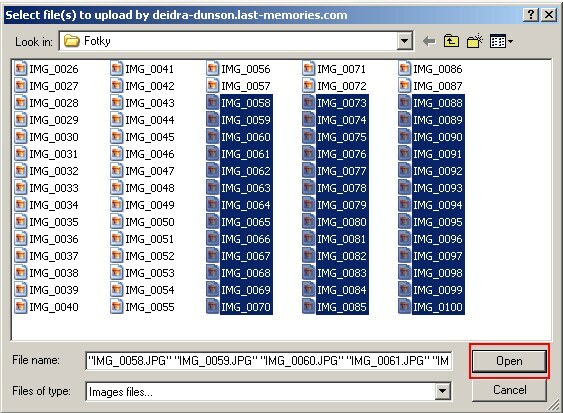 If you want to paste more pictures at a time, click browse button after selecting each picture and select a new picture. 5. If you want you can add description to pictures. 6. Press Save button at the bottom of page and your pictures will be uploaded. You can select maximum 20 pictures in one go. The saving speed will depend on your Internet connection. The better way is to use MULTIPLE IMAGES UPLOAD. With this feature you can upload unlimited photos by one click on mouse. 3. 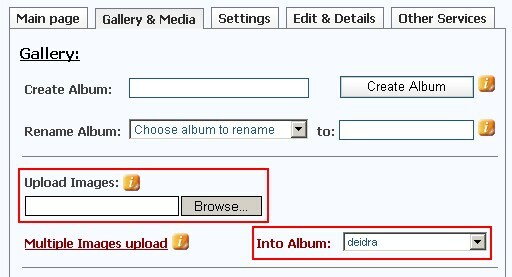 Choose album where to upload pictures and Click Multiple Images upload. 4. In new opened window click Browse button. 5. Choose pictures you want to upload. 6. If you want to upload all the pictures in your folder just press CTRL+A on your keyboard, this action will select all pictures. 7. If you want to select only some of the pictures push CTRL key and while holding it just click any picture you would like to add. 8. After you select all the pictures you want to upload just click OPEN and then CLICK TO UPLOAD IMAGES button. Description of the picture will be saved according to name of picture.